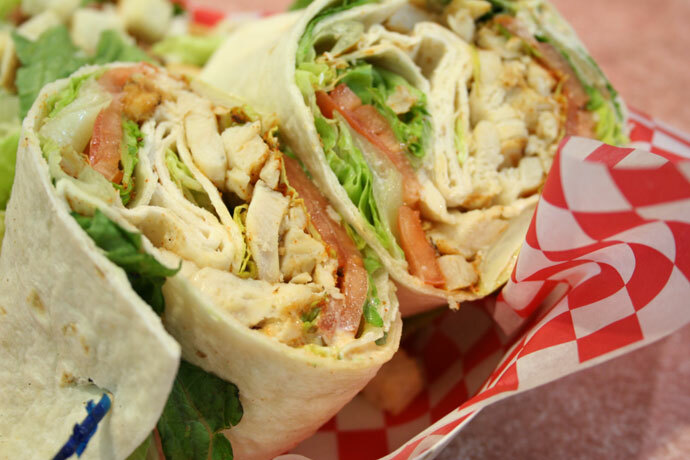 While visiting the Halifax Airport (web site) in Halifax, Nova Scotia, Canada, be sure to drop by the food court located in the centre of the airport, and enjoy some fast food before your flight. Pictured below is the Cajun Chicken Wrap with a side Caesar salad which was $8.48 before tax, which I purchased from the Brisket Deli. After eating, take the elevator up to the airport observation deck and sit in the comfy chairs while watching planes take-off and land through gigantic floor-to-ceiling windows. The observation deck is also a popular plane-watching destination for families with children and can be accessed even without a boarding pass. 16,836 views. This entry was posted on Tuesday, August 28th, 2007 at 8:45 pm	and is filed under Airport, Cajun, Chicken, Fast Food, Food Court, Food Photos, Halifax, Nova Scotia, NS, Outside Vancouver Area, Restaurant, Tourist Attraction, View. You can follow any responses to this entry through the RSS 2.0 feed. You can leave a response, or trackback from your own site. Aug 18/13 I tried to have a meal at Beaches at the Halifax airport. The waitress walked by me at the counter so I took a seat and read the menu. She waited on a lady a few seats away and continued to carry on an extended conversation with her. The waitress then turned and walked away. I did see the cook resting on his elbows so I do not think they were too busy to take 2 orders. I left and received excellent service at the next restaurant.